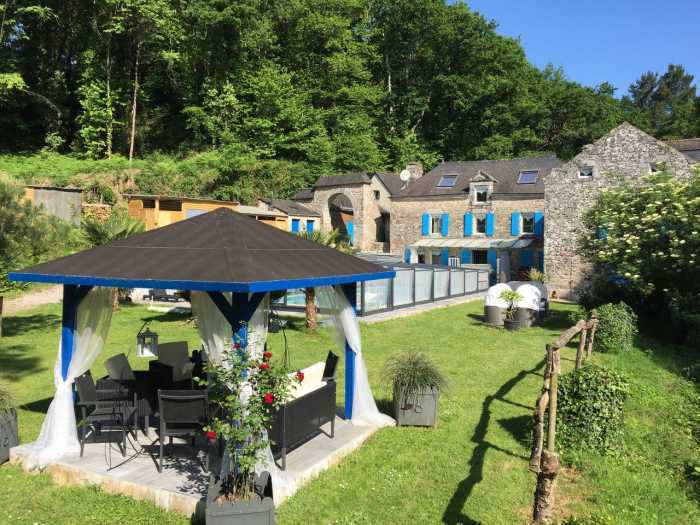 Properties for sale in Brittany, France - AHIB-2-DN-617 Vannes 56320 Gorgeous 7 bedroomed watermill set in its own valley on 5 acres with pool and bubbling stream! AHIB-2-DN-617 Vannes 56320 Gorgeous 7 bedroomed watermill set in its own valley on 5 acres with pool and bubbling stream! Within in easy access of the town of Vannes and 15 mn from the coast and beaches is this glorious watermill set in its own valley. Although the property is set on the edge of a village, as soon as you engage onto the private drive you have an impression that you are in the middle of the countryside. The lane curves down through the woodland, alongside the 5-acre lake before arriving at the mill itself. The mill house's roots can be traced back to 1340 and was fully renovated around the year 2000 to 2005. It now offers you on the ground floor a large fitted kitchen opens onto a family lounge and an original feature fireplace, leading on from here you have an equally spacious dining room in the second wing. The upper levels are accessed via separate stairs in each wing. To onside you have an upper level with family suite including bedroom, dressing room and ensuite bathroom/shower and a guest bedroom with ensuite shower room. Above this, on the 2nd floor you have a landing and two further bedrooms, both with ensuite shower rooms. In the second wing, on the 1st floor you have a second lounge area, once again with ornate fireplace, as well a securised study and a separate entrance out to the parking area. Then above these, you have another two bedrooms both with ensuite bathrooms. To one side of the mill is another separate small building which houses another suite with private lounge, shower room and a bedroom. To the front of the mill is the main garden with large terrace area and a covered heated swimming pool and stream bubbling through the middle. To the rear is the 5-acre lake which is private waters. Then the rest of the land is woodland, that give this property that very private feel. If you are looking for somewhere to relax and commune with nature, but do not want to be in the sticks, then this might be it! Sliding windows. Balneo bath. Fireplace, Double glazing, Internet, Jacuzzi. Blinds. Carport. Exterior lighting. Alarm, Digicode. Intercom, Electric gate. Pool, Spa.